FRAUD AND SCAMS ON ARTISTS. Just so you know, you are not alone – so what to do?. Here is our latest scammer to watch out for, Ralph Lauren of all people. The Internet is like a watering hole in the Serengeti Desert. It attracts all forms of life, the meek and the nefarious. It is important to know what to do when called to the Internet to do something. Who called you there and why? If you have a website or email, you've all experienced spammers and fraudulent people trying to get your attention or phishing for emails etc. Scammers leave a lot of evidence behind, we just need to be able to decipher it. This is the way of the world in 2018, no different than sorting out junk mail you receive at your door step. HOW NAIVE ARE WE ARTISTS? What is it with email that we think we need to respond to everything or that everything is legit that is received in our inbox? Does someone actually want to buy my work when they contact me through my website? Why would they otherwise? Do I expect someone to filter this, so I only receive legitimate requests? This is quite impractical and does broach some privacy laws, even for your internet provider. You can set the security levels up, but this could also filter out legit requests. Artists in Canada has been monitoring the exploits of one scammer targeting artists playing on their naivety when it comes to selling their art online. At present we make sure all requests for your art are filtered through your own personal websites, so it is advised they don't see your email address, just fill out the form email and security captcha. This is great for getting rid of BOTS, but people with a legitimate email can still get hold of you, even scammers. It does take a lot of their time. To start make sure the potential buyer, if out of the country or someone you don't know, pays using PayPal or similar service. You will find the person will generally stop contacting you. You could post this on your payment section on your website as well. 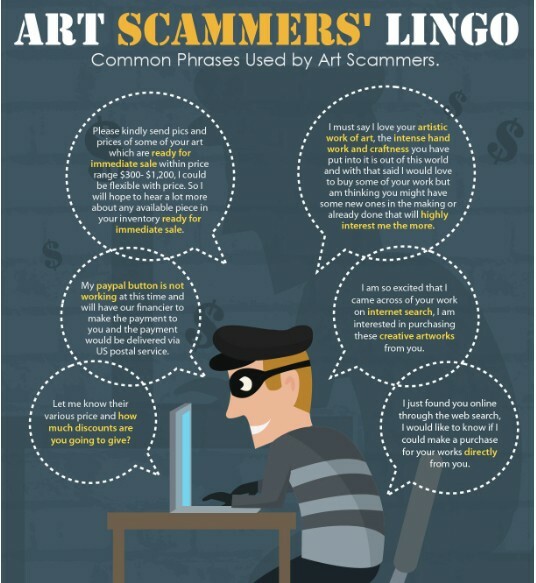 Here are a few tell tale signs that it is a scam in no particular order. 3. They will send a 'check' and arrange pickup of the art. 6. They will ask for your address. I am including the website for the RCMP Protection Services. You can report fraud directly to them It is important that the RCMP see this is a growing scam.